8x12 Handmade in Europe, these stunning thick wood prints are made to withstand several PCS moves. Easy to hang. They are covered with a protective layer that expands their lifespan and appearance. Quote will be a mother's quote. Diff frame options are available. WHEN: Your scheduled time. Plan to spend aprox 30 min at your appointment or less. What exactly is a "Design and Ordering Appointment"? 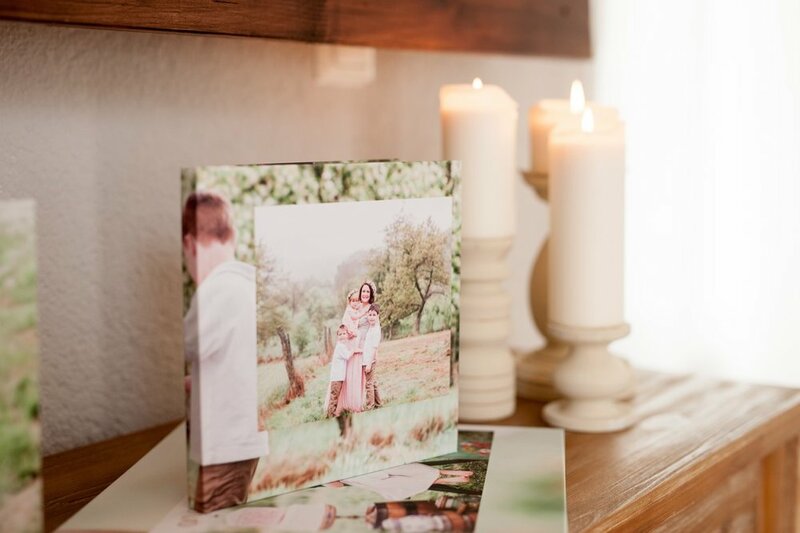 It's just what it sounds like: a time for you to view the printed proofs from your photo session and purchase your collection. You will view a short slideshow of your images, then we will work with you to narrow a keepsake or any additional wall art you would like. You will be able to look at samples of products as well as all pricing information and will place your order at this time. Who should attend this appointment? Anyone who would like to purchase images from your session. Anyone needed to make a decision regarding purchases. Can I bring my children? From our experience, a child-free session works best. We want you to be able to relax and enjoy this process. If you have no alternative and do need to bring your child, please know we have an entertaining space for them. My big kids are wonderful helpers and can play with them outside if it's nice! What if someone wants to order but can't make it that day? We will do our best to find a time when everyone can come. If it is not possible for everyone to be there we will be happy to post your purchased images online where your family can view them and make their selections. These are high resolution images that you can use to make professional-quality prints (a printing release is included) at our list of approved printers in the US. What do most people purchase? Depending on the final number of favorite images, most clients purchase a wall portrait or grouping. Also popular are albums, collages and digital negatives. What can I expect to spend? As mentioned at the beginning of your booking appointment the only requirement is a collection purchase, however for these event sessions typical sales range from $300-700 or more and of course, payment plans are available. When do I make payments? Most clients pay the total at the time they place their order. We also offer payment plans that can extend as long as 3 months. Our preferred method of payment is credit or debit card, though we do accept cash. If you purchase digitals a collection or product, we will not be able to release the product until after final payment is made. When will my order be ready? Print orders are normally ready for pick-up in 2 weeks (depending on the season). Albums, framed prints and other specialty products take 4-6 weeks. We will contact you when your order is complete and arrange a time for pick up! We appreciate your business and want to be sure you are well-informed through every step of this process. Choosing artwork for your home should be a fun, creative experience. We're here to help! If at any time you have questions or recommendations on how we could improve our service to you, please let us know. We want you to be delighted with the results of our time together. We want you to share your experience with your friends, and most importantly, we want you to come back!! !